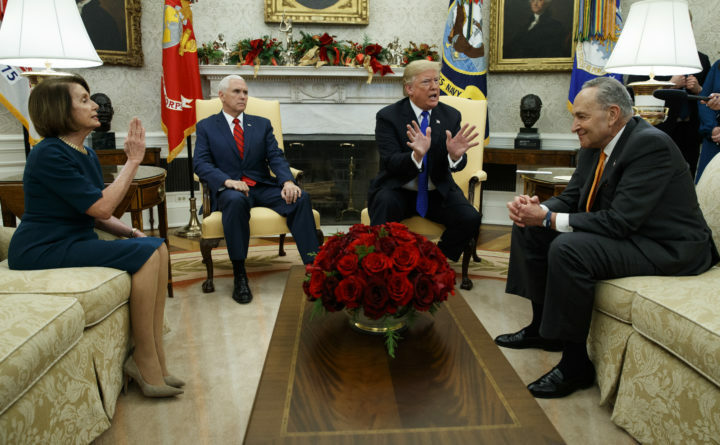 House Minority Leader Rep. Nancy Pelosi, D-California, Vice President Mike Pence, President Donald Trump, and Senate Minority Leader Chuck Schumer, D-New York, argue during a meeting in the Oval Office of the White House in Washington, Dec. 11, 2018. Why is President Donald Trump so committed in January 2019 to his demand for $5 billion for building a wall on the U.S.-Mexico border and to continuing the longest government shutdown in U.S. history? Could it be his self-interested, mean-spirited attempt to divert the media and public from the increasing information coming from the federal investigations into the Trump campaign’s, administration’s and businesses’ connections with Russia? In 2017 and 2018 the Republicans had total control of the U.S. House and Senate. Why was there no demand for large “wall” funding and no 24-hour a day media “southern border crisis” then? Is it because congressional Republicans, as well as the general public were not in favor of the wall? Is it because the number of people crossing into the U.S. from Mexico was decreasing? On Dec. 18, there was agreement from the president and Republican House and Senate leaders for wall funding and funding until February for Homeland Security Department as well as funding for rest of the federal departments through Sept. 30. The House and Senate passed differing funding measures. Congress went home for the holidays. Immediately, the president was threatened by far right broadcasters (Rush Limbaugh, Ann Coulter, Breitbart) with loss of support from his “base” if he did not get an increased down payment of $5 billion for wall funding. Trump then promised he would veto any package that did not give him $5 billion. A quarter of the government was shut down. The crisis at the southern border is a humanitarian one. Conditions in some Central American countries, such as El Salvador and Guatemala, are horrific. Young families are fleeing to legally claim asylum in the U.S. Meanwhile, there are too few immigration judges and many asylum seekers are forced to stay in Mexico in dirty, cold conditions without adequate food, water, housing or clothing. Trump has pledged to reduce aid to Central America failed states. Government data show that most drugs are coming in through legal ports of entry and the mail and only six people on the terrorists watch list were stopped at the southern border in the first half of 2018. More terrorists are U.S. citizens or come in via airplanes and the northern border. Since Jan. 3, House Democrats (and a few Republicans) have been passing the same funding bills passed in December to reopen the closed government agencies. The economic costs from the shutdown are rising each day to citizens, government workers, small and large businesses and local, state and national governments. U.S. senators should force Majority Leader Mitch McConnell to call for a vote on funding. Call Maine Sens. Susan Collins and Angus King. Pamela Person of Orland is a former constituent services worker for U.S. Rep. Mike Barnes of Maryland. She is also the co-founder of the Coalition for Sensible Energy and Maine Global Climate Change.